If you have questions about the program please contact me (Joli) by phone at 913-856-8356 or by email (use ‘KHPA’ one the subject line) at joli@heartlandhoney.com. Please start letting folks in your local area know so that they can save the dates. KHPA Meeting Information (link). If you belong to a local beekeeping group please promote our meeting to your group. 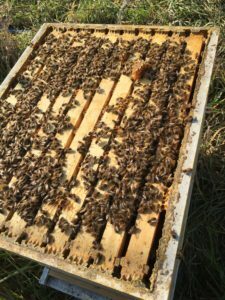 The fall 2018 meeting of the Kansas Honey Producers will be held in Great Bend Kansas at the Best Western and Perkins. Details will be available soon. Please “Save the date”. The Kansas Honey Producers Association (KHPA) is a not-for-profit IRC 501(c)5 agricultural-educational organization; run by dedicated volunteers; supported primarily by membership dues (subscriptions). The IRC status means that the association is a tax-exempt organization. While donations are always welcome, they are not tax deductible as a charitable contribution but membership dues and subscriptions may be deductible as ordinary and necessary business expenses. This entry was posted in Bee Clubs, Beekeeping, KHPA and tagged beekeeping, Kansas Beekeeping, Kansas Honey, Kansas State Beekeepers by Robert. Bookmark the permalink.